Landlord-tenant law protects both landlords and tenants regarding lease agreements and rental agreements. Various federal and state laws set forth landlord rights and renter rights related to the property, duties, responsibilities, and obligations. In this article, we focus on the rights of property owners as landlords. Renting a property involves many rules and regulations–for both the landlord and the renter. For example, landlords have the duty to protect against unsafe property. However, landlords also have the right to inspect the property, with notice, to ensure it is safe for tenants and visitors. As a property owner, it’s essential to know your rights before entering into an agreement with a tenant. Landlords and property owners may have the right to choose who occupies a rental property house; however, state and federal laws protect the rights of a prospective tenant from being subject to discrimination. Federal fair housing laws apply to rental property throughout the country. The protections against discrimination in fair housing laws apply to all aspects of landlord-tenant law. For instance, a landlord may not advertise a property rental with statements that indicate a preference based on protected categories. Likewise, a property owner cannot set more restrictive standards related to the rights and responsibilities of a tenant that is a member of certain groups. It would be against fair housing standards for a landlord to require tenants to pay larger security deposits or higher fees for non-payment of rent because the renter was a member of a certain group. In addition to federal fair housing laws, many states have enacted fair housing laws that apply to rental property within their state. For instance, California landlord-tenant law also adds several other protected classes to its landlord-tenant law. California property owners are prohibited from discrimination based on sexual orientation, gender identity, gender expression, source of income, genetic information, medical condition, and marital status. Colorado landlord-tenant law adds creed, sexual orientation, marital status, and ancestry to its protected classes for potential renters and tenants. Ohio landlord-tenant law adds ancestry and military status to its protected classes. In comparison, Florida landlord-tenant law does not add protections for additional classes, nor does Texas landlord-tenant law. Before renting or leasing property, a landlord or property owner should review the federal fair housing laws and their state fair housing regulations to avoid violating landlord-tenant law. The above list is not an exhaustive list of the terms that a property owner should include in a lease agreement to protect the owner under landlord-tenant law. In addition, states often have specific laws related to lease or rental agreements and contracts. Landlords must ensure that the agreements they use conform to all state laws for a valid, legally enforceable contract. For instance, California landlord-tenant law limits deposits to two months’ rent for unfurnished rental property and three months’ rent for furnished rental units. Deposits must be returned within two weeks of the termination of the rental agreement. On the other hand, Ohio landlord-tenant law does not have a limit on deposits, and Maryland landlord-tenant law limits the security deposit to two months’ rent. Landlord and property owners should avoid using a template or standard rental agreement found online. The terms and conditions in the template may not be applicable or valid within their state. It is always best to request the legal services of a real estate attorney to ensure that the lease agreement or rental agreement the landlord is using conforms to all state landlord-tenant law. Damage to property — A landlord may not have the right to evict for normal “wear and tear” of the property. Also, if the tenant makes the repairs or pays for the repairs, with the property owner’s permission, a landlord typically cannot then evict based on the repaired damage. Do renters have any rights? Landlords are also prohibited from evicting tenants based on discrimination or landlord preferences, such as the renter plays music the landlord does not like, or the landlord does not like the tenant’s profession. Some states also prohibit constructive eviction, which entails the landlord removing the renter’s property without a court order, turning off the utilities, or changing the locks. Is it hard to evict a tenant? The eviction process is governed by state landlord-tenant law. Therefore, landlords must refer to the laws in their state to determine the process for evicting a renter. Because state legislatures enact laws related to tenants’ rights within the state, eviction laws vary from state-to-state. Post the notice of eviction on the property door. Every eviction begins with providing written notice of eviction posted on the tenant’s door. To be valid, the notice must contain exact wording and the deadline to remedy the breach. In addition to posting the notice on the door, the landlord may also serve the notice in person or by certified mail to the tenant. After the notice period expires, the landlord may file an eviction complaint (Complaint in Forcible Entry and Detainer) with the court, if the tenant has failed to correct the breach of the lease agreement or failed to vacate the rental property. The court schedules an eviction hearing within a few weeks after the eviction complaint is filed. The landlord must attend the eviction hearing. The tenant may also attend the hearing. The court listens to the evidence presented in court. If the landlord provides sufficient evidence for eviction, the property owner may apply for a writ of set-out and/or restitution. In most cases, the judge gives the tenant five to seven days to vacate the rental property after the writ is executed. If the tenant refuses to leave the property, the landlord must request a scheduled time for the court bailiff to remove the renter from the property. The above steps are a brief summary of what is involved in evicting a tenant. Depending on the cause of action or the type of lease agreement, the court may require additional steps for a legal eviction. How many days does a tenant have to move out? The basic steps for eviction are the same in most states. The notice periods are often different and the time to vacate the property may be longer or shorter. Because local laws vary, the safest option for a landlord who needs to evict a tenant is to contact a legal professional to review the landlord-tenant laws in that state. Landlords have the right to furnish and decorate furnished rental property as they see fit. The property owner has the right to choose the flooring, paint, fixtures, appliances, and other items in the home. If the landlord is renting a furnished home or apartment, the landlord chooses the furniture. Typically, a furnished property has a higher rental rate and a higher security deposit compared to an unfurnished property. A furnished rental property typically includes all appliances and a basic living room, bedroom, and dining room set. Depending on the landlord, the furnished unit may also include decorations, linens, dishes, stereo systems, televisions, and other items. Fully furnished rental property is appealing to individuals who may not be staying in one place for very long or who are not interested in owning a lot of property right now. For a landlord, furnishing an apartment or other rental unit requires a higher investment and the landlord is responsible for normal wear and tear on the furnishings. Whether you’ve invested in apartment units, single family homes, multi-family housing, or residential assisted living facilities, it’s important to know your rights as a landlord before entering into a binding agreement with a renter. While tenant rights and protections may vary from state to state, the law offers protections to landlords, as well. Landlords have the right to choose a renter as long as they don’t discriminate against a protected class. As a property owner, you can set the terms of the lease, and you have the right to inspect the property, furnish the property, and evict a tenant who violates the lease agreement. Investing in real estate can be a lucrative business venture. 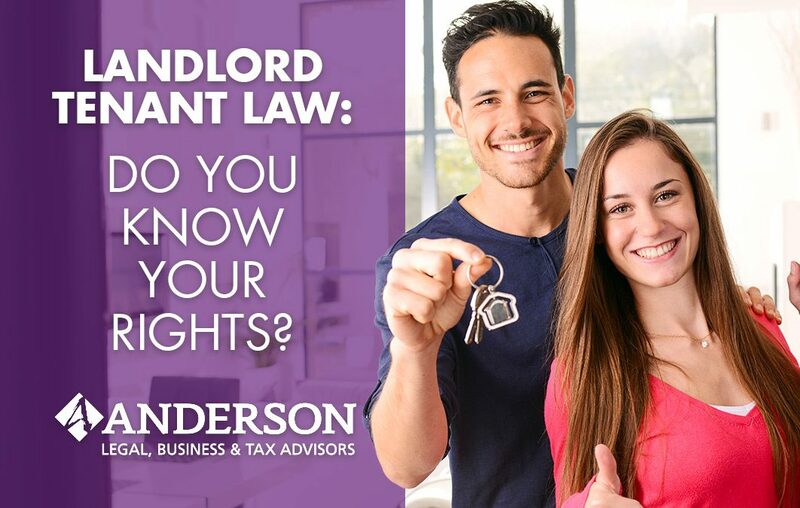 If you are interested in investing in rental property or you have legal questions as a landlord, contact Anderson Advisors today. The team at Anderson Advisors can help you protect your investment and improve profits by creating an investment strategy tailored to your specific needs and goals.